interest in more of the PCBs/front panels? for the front panels i would need to order at least 30pcs, though. the price for a single front panel would be 10.-EUR/13.-USD now. Thomas Henry recently developed and published four new circuits, and i got his permission to do PCBs for these. I already did the LFO Controller, and the next in line is the 555-VCO. Prototype PCBs are in and will get assembled soon. I think this is an intermediate project. Not that large, but some calibration is needed, a DC coupled scope would be helpful. no obsolete parts are used (all you had to do was match the transistors of the expo, if needed for less drift of scale). A lot of people already indicated interest or placed pre-orders in another thread, however, to keep things more traceable i decided to create this new thread dedicated tot he 555-VCO only. the VCO should be available end of january 2013.
i will do an actual "circuit" board (providing MTA-100 connectors for all external connections), and an optional "eurorack" front panel components PCB for those who do nto want to do all the wiring. and this time i will offer a frontpanel (top notch quality, the same process i use for my fonitronik production modules) - price TBA. the front panel will be 16HP, giving you enough room for comfortable wiggling (note: you will NOT be able to talk me into 14HP). so if you wanted to express your interest do it in a way that makes perectly clear what you want, i.e. 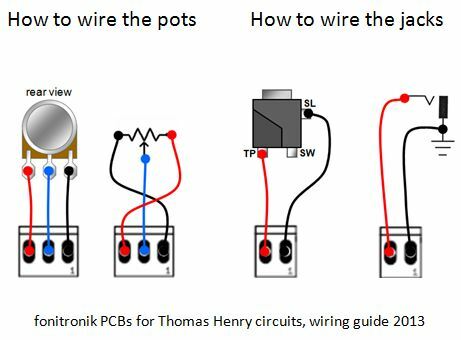 for the pots any vertical mounted 3-pin 9mm pot should do, i used alpha and alps (for the values needed refer to thomas' schematic). to connect the control board to the cicuit board you will need single row headers and receptables. 4 circuit pcbs please, no panels or panel pcbs. I missed out on the last run of X-4046 because of a paypal issue, but its not an issue anymore. Put me down for 4 x circuit PCBs please! EDITed to reflect my interest on panel too. At least 2 circuit pcb's depending on the price. Hopefully more! Edit to clarify - 2 main pcbs for me, cheers. With your usual keen pricing and great PCB quality this is a no brainer. Put me down for two please. I am vering towards switched octaves in stead of coarse tuning. Does anyone else think this way or will I be measuring and switching on my own...???? I am leaning towards a fully modular approach, with a couple of Octave/Note CV generators planned that I can use on any oscillator. I'm completely with you in spirit though - the octave switches on my System-100m and Doepfer VCOs are very useful. 2 main circuit PCB's for me please. 2 x circuit pcbs for me, please. 2 circuit PCBs only for me as well, please. On topic, if I manage to build the random looping sequencer kits I bought, maybe I might try to build a VCO as well. Though at the moment I'd prefer a kit, not having a shedload of common components at home. i added some info to the first post. and one for PCB mounted front panel components in eurorack format. and then i will offer a front panel. so if you indicate interest here, please state what exactly you want/need. i will not modify thomas circuit. i will offer PCBs just for his circuit design, and you will have to use his schematics to build this. I'd like 2 circuit boards only. Thanks! Looks like 15-25 bucks in components pre VCO what a killer design!